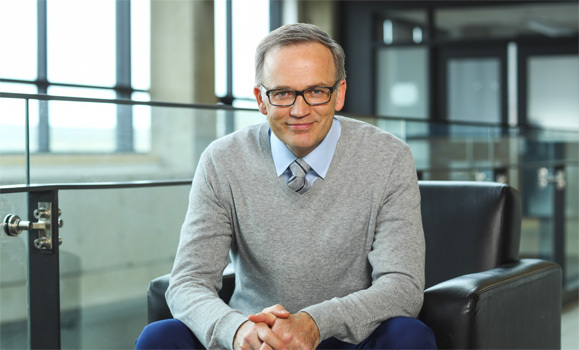 President Richard Florizone joined the Dal community as its 11th president and vice-chancellor in 2013. It’s been an eventful five-and-a-half years for the university: big awards, major research announcements, national profile and growing international reach — all culminating in celebrations to mark Dal’s 200th anniversary. With Dr. Florizone set to leave Dal at year’s end to take on a new role leading the Quantum Valley Ideas Lab in Waterloo, Ont., he sat down for an in-depth chat with Dal News on his time as president. Read part one of the interview. In part two, Dr. Florizone discusses working through some of the major challenges of his time in office and reflects on what he’ll miss about the job and the lessons he takes from his presidency. Any presidency is not without its challenges — and some of the ones Dalhousie has faced during your time have received attention and scrutiny on a national scale. Certainly, the situation with the Dentistry Facebook group in 2013 stands out, but there are others as well. Talk to me about managing situations like those as president — situations that don’t always have easy answers, and involve difficult subjects. It’s not easy, and when you’re dealing with complex issues, it takes a complex approach. Nevertheless, I leave this office really struck by the power of our mission and our values — and how those can be guideposts for us, not just when seeking out opportunities but when facing real challenges. As strange as it might sound, you meet both of them in the same way. When issues become public, there are a lot of voices, some panicked or concerned about the short-term reputation of the university. But we have to always remember that the long-term success of Dal — and by extension, the long-term reputation of Dal — rests on our mission and our values. So we must always come back to those. What will advance our mission of teaching and learning, research, and service? What’s really going to support freedom of expression, academic freedom, institutional autonomy, respect and inclusion? Of course, the difficulty comes when some of those values appear to conflict with one another. That’s where the importance of discernment and pause come in. What I’d tell my successor is when tough things happen — and they will — there will be a lot of excitement, but make sure you’re guided by the mission of values of the institution, and make sure to pause and take the time to consider all those complex issues, to rely on others, and discern a path forward. The other thing I’d say is that we made a commitment not to sweep these debates under the rug. And that’s not always easy for all individuals within an organization to manage, but it’s important — as was the commitment not to rush to judgment. We said we were going to address those issues as human institutions, guided by our policies, to work towards a just outcome — while, at the same time, living up to our commitment to address the broader issues. That’s part of our responsibility, too. Such events certainly gave urgency work across the university in diversity, inclusion and equity. But it’s fair to say those topics — which increasingly define our current socio-political era — were coming knocking at Dalhousie’s doors regardless. What would you say is the role and responsibility of a university in addressing diversity, inclusion, equity? Where do you think we’re making progress? And what are areas where there is still significant work to be done? These issues are complex, they’re historical and they’re emotional. And I think it’s understandable for some university administrators to have a human, emotional response to them, and sometimes that response can be something like, “Oh, I don’t want to get into that.” But that’s why it’s so important to go back to the mission and values and to ask: if not us, as a university, then who? If we aren’t having the tough conversations, who is? And what would that say about us, if we stepped aside and absolved ourselves of that? For me, I get real satisfaction out of the hard, tangible progress we’ve made on our hiring gaps. I’ve also certainly learned, as president, the importance of symbolic gestures; it’s been a learning, for me as a leader, to see what raising the Mi’kmaq flag, for example, has meant to so many people. But there’s also the CFO inside of me who wants to know, “What measure changed?” And to see our hiring shift where we’re closing the labour market gap in key areas, that’s a source of pride — because that’s not me mandating anything. That’s the institution, the hiring committees, making different decisions. 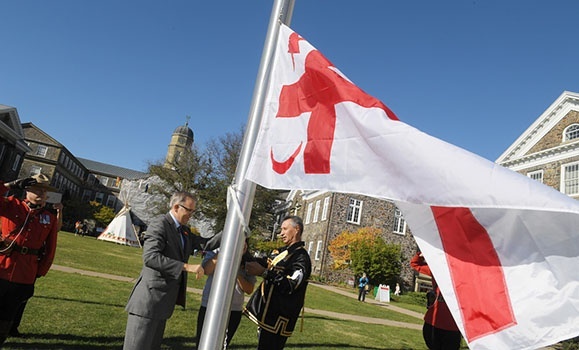 President Florizone helps permanently install the Mi'kmaq Grand Council Flag on Studley Campus together with Grand Keptin Antle (Andrew) Denny (right), and Dal student Melanie Hardie. The work ahead, it’s so vast: to create an institution and society in which all feel like they belong. There’s so much to do. It’s about creating an environment in the true spirit of inclusion, one where everyone can reach their full potential and feels included. It’s going to be up to all of us, but I hope some of the initiatives we’ve taken and the conversations we’ve started keep moving us further down that road. It’s an area where Dalhousie should be a leading light. What do you think are some of the biggest challenges facing Dalhousie — or higher education institutions in Canada more broadly— at this particular moment? What’s kept you up at night as president? And what makes you optimistic for the future? What worries me right now, as vague as this sounds, is political polarization in our broader culture and how it might impact universities. Strongly held views are good when they’re backed up by evidence. But overly polarized views can halt progress. When you have people with different views who are willing to sit down and reconcile their differences in the spirit of finding progress, that’s great. But there are debates I sense, at times, that have become so polarized that increasingly I’m hearing voices say, “my way or the highway.” And that’s a problem, because progress requires discernment, pause, thoughtful discussion. As we try to grow and make progress, at a very tangible level it involves decisions, and those decisions involve debate. And to work through those debates to get to a decision requires reaching some consensus in our governing bodies. If someone’s saying “my way or the highway” and the other side is saying, “That’s completely unacceptable” then you’re nowhere. But ultimately, I’m very optimistic about universities. And that’s because so many of the opportunities and challenges we face as a society run right through the mission and values of the university. They’re issues that entwine social justice, economic, environmental, political issues. The university, in many ways, is ideally positioned to consider that mix. I’m very optimistic about our future: there’s no question the future is brighter for universities. You’ve gotten to help lead Dalhousie through its 200th anniversary celebrations and dip its toes into what its third century might have in store. What has this anniversary year meant to you, and to the university? It’s been so great. One, it’s about celebrating the history of this great university — the successes, the growth, the people. Think how tiny this place was at the start, how uncertain its future was, and now we’re one of the most important institutions in all of Atlantic Canada. Two, it’s the chance to thank people — to thank alumni, our staff and faculty, our donors, our communities and so many more. It’s personally rewarding to be in a position to recognize people’s contributions to making our institution better, which in turn has made the world better. President Florizone and other performers/speakers at February's Bicentennial Launch take a curtain call. And then three, it’s the chance to look to the future. Things like our Belong Forum series and the Great Debate have been even better than I’d hoped for because they’ve caused people to stop and think about what the future might hold. We’re wrestling with big questions, openly, about humanity and what lies ahead — ones that are fundamental to not just our institution, but our society. In the new year, you’ll be moving to Waterloo, Ontario to lead the emerging Quantum Valley Ideas Lab. When your departure was announced back in June, it was described as “the opportunity of a lifetime.” I expect many would say such a thing about a university presidency, too. What was it that made this new role an opportunity you felt you had to pursue? Well, I’m proud and happy to say they’re both opportunities of a lifetime, and it means a lot to me that they’ve come about at times in my life when I’ve been able to pursue them. To be the president of Dal is an absolutely singular experience, and I’m so proud of what we’ve done here and how we’ve met both the challenges and opportunities we’ve faced. And I’m so proud of this community, and the things we’ve been able to unlock together. I feel like I’ve been part of a historical moment at Dalhousie, and it’s truly been a privilege. In my heart, I’m a physicist. I started out as a kid with the mind of a scientist, and what attracted me to physics — away from engineering, where I’d started — was quantum science. And so, the chance to help lead the nation in that field, just as it’s truly coming into its own, it was hard to imagine saying no to it. 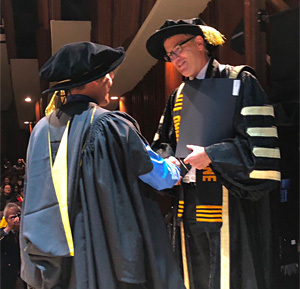 Although my tenure at Dal is a little shorter than some might have expected, it also feels like a natural point, in some ways, to move on. We’re at the end of our 200th anniversary. We’re at the end of our current Strategic Direction. We’ve made some great progress, and while there’s certainly much more to do, my hope is we’ve demonstrated what’s possible as a community, together. “Nobody does anything alone.” Those words have shown up time and time again during your presidency: they were in your installation address, in your bicentennial address, in countless speeches and event remarks over the years. It’s clearly a mantra you carried with you long before you became a university president. Has its meaning changed for you, in any way, through this experience? Absolutely. My belief in it has strengthened as I’ve seen the power of this community and what it can do. As you get older, as you go through life, you develop a deeper respect and appreciation for those who’ve come before you or supported you: your family, your friends. 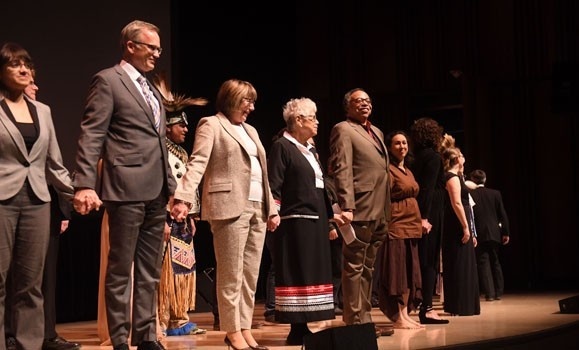 Here, there’s a lot of great wisdom we can take from our Indigenous friends and colleagues, in how their ancestors and Elders are appreciated and understood. Then in a job like this, you have an appreciation for all those who’ve came before you in time, as well as those who are with you as part of the institution. Ultimately, you’re just one individual with one set of hands — if you want to build a better world, you have to have a deep appreciation for the fact that no one does it alone. Is there an accomplishment of your presidency that you’re most proud of? Or a moment that sums up, for you, what this experience has been like? What jumped out at me, thinking about this, is every time I shake a student’s hand at Convocation. When I shake a student’s hand on that stage, I get about 30 seconds that represents two, four, six or more years of their life. It reflects years of hopes, dreams, aspirations and investments. Sometimes people are there surround by family and friends, and you see the emotion and tears in their eyes. Sometimes they’re entirely alone, and they still have a big smile on their face. Either way, it’s a visceral, real and emotional reminder of the transformative power of education — what this institution does every day. It’s this moment in the human experience that has come together at Dal, and we’ve been part of it. It’s what it’s all about. What will you miss most about being Dal president? And what will you miss the least about the role? The best part of the job is the breadth of the issues — and the worst part of the job is also the breadth of the issues. It’s the best in terms of the diversity of the job. You just don’t know, every day, what it’s going to be. You get to revel in excellence and diversity. There’s just so much in the course of a day: meeting heads of state, interacting with students, working alongside world-leading researchers, chatting with custodial staff to see what they’re up to, going for lunch at the dining hall — it’s just so incredibly rich. You have to be envious of that. The downside, though, is you’re running this institution of more than 25,000 people with the full spectrum of both human success and human weakness and the challenges that comes along with that. There’s a lot that happens at Dalhousie every day, and the reality of the job is that while some really great stuff makes its way to the office, much of the toughest stuff does too. What’s something you’ve learned about yourself, from your Dal experience, that you’ll take with you going forward? I think you’ll have to ask me in a year! Right now, I’m looking forward to focusing a bit on a single sector in my new role — but people have warned me I might miss the diversity of the president’s job, so we’ll have to see. In terms of what I’ve learned, overall, it’s certainly deepened my own knowledge and understanding of leadership, of bringing people together, and the importance of defining and communicating a vision. I have to be honest, before this job I kind of didn’t get the whole “vision” concept, in how it’s often expressed in management-speak, but now I see the point of being able to crystalize an idea into something tangible for people. And, to come back to something else I mentioned earlier, I’ve learned how important is to address opportunities and challenges with the same approach, the same values. Whatever you’re faced with, if you go back to your fundamental values, you’ll find your guideposts. Each Dal president has left a mark on the institution in their own way. Do you feel like you’ve been able to leave a legacy at Dalhousie in your time here — and, if so, what do you think or hope it is? I feel a little bit queasy talking about my legacy, to be honest. What I hope is that what we’ve shown, together, is this idea that when we come together in new ways, fueled by the university’s mission and values — including our belief in the transformation power in education and knowledge, that commitment to free expression, to respect an inclusion — when we do that, look what we can do. We can bring together the very best of our region with the very best in the world for the benefit of all — not just our institution, or our region, but our country and the world. That sounds grand, I know, but it’s the truth. I hope people feel invigorated about where we’re at now as an institution. And I hope they feel we can do good and do well at the same time. It’s not just about being successful — it’s that, right here in Atlantic Canada, we can come together, guided by our mission, to build a better future for all.